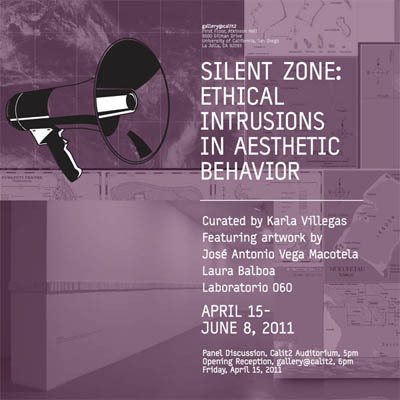 Curated by Karla Villegas, Silent Zone: Ethical Intrusions in Aesthetic Behavior features the work of José Antonio Vega Macotela, Laura Balboa, and Laboratorio 060. The exhibition includes “Time Divisa,” a ceramic tile relief installation that replicates the main wall of the Santa Martha Acatitla prison in Mexico City, and “The wind blows where it wants to” a series of dialogues with inmates of the prison, by José Antonio Vega Macotela. Laura Balboa’s installation “.tv,” refers to the internet country code top-level domain for the islands of Tuvalu, and uses projection and LCD displays to visualize the islands, a country in danger of disappearing due to ecological decay and global warming. Silent Zone aims to explore and reveal the different views of marginalized and peripheral regions, in face of the logic that prevails on the current globalization process. The project argues that technology is not only a comprising factor, but also an excluding one, since the distribution of knowledge and technology in the global era is far from uniform. It is precisely this that leads to the emergence of other technologies and other forms of knowledge. In this project, the dialectics of the global and the local collide into the need to acknowledge other devices that are currently emerging in technologically restricted realities. In turn, this allows for the appearance of discursive platforms that compel us to (re) think the role of technology in the arts. Finally, the project wants to understand the different appropriations of technology from horizons that transcend the local, in order to explore forms of production and organization that enable political and cultural resistances against the hegemony of the global, as well as ethical strategies rooted in aesthetic behaviors. Karla Villegas is a curator and researcher in new media art. She holds a degree in Philosophy from the National Autonomous University of Mexico (UNAM). In 2002, she co-founded the Research Unit at the Multimedia Center in Mexico City, where she directed the project .Doc, an historical review of the electronic arts. She curated the projects Preview: La Máquina Estética by Manuel Felguérez and Sintesis Libre for the Electronic Arts and Video Festival Transitio_mx 02. She was also the artistic director of the Transitio_mx Festival in its third edition (2009), Autonomies of Disagreement. She has written several essays and texts, mainly on issues around the digital arts, philosophy and the cognitive sciences. José Antonio Vega Macotela was born in Mexico City, where he lives and works. He graduated from the National School of Fine Arts ENAP – UNAM in 2001 where he began his public and social art research. He was the co-editor of the publication Multiple Media 2 in 2008. His works have been exhibited in places such as the Museo de Arte Moderno, Museo Carrillo Gil and the Laboratorio Arte Alameda, Mexico City, Mexico, and the Leme Gallery, San Paulo, Brazil. Currently he is doing an artist residency in Rijksakademie, Netherlands. Laura Balboa lives and works in Mexico City. She is a multidisciplinary artist. Her artwork collapses boundaries between sampling, video, live cinema, drawing, objects, sculpture, sound art, installation, site-specific, language, media art essays, documentation, netart, concrete poetry, code poetry, error leading, chaos, DIY-DIT, life hacking and open data. She has worked for Centro Multimedia at the National Center for the Arts Mexico (2007-2010), has been a one-year fellow (2008-2009) for Jóvenes Creadores, FONCA, and has had exhibitions in San Francisco, Quebec, Mexico and Spain. She collaborates currently for a visual arts project involving mentally ill inmates with the support of the Public Program of the Jumex Art Foundation. Laboratorio 060 (for this exhibition: Lourdes Morales and Javier Toscano) is an interdisciplinary arts collective founded in 2003, engaged in approaching art practices as an alternative way of world-making. Their recent work has turned to the critical analysis of art as a social surplus product, where minute interstices can be widened for the creation of “otherness”, the production of future and the imagination of paths for the manufacture of politically creative encounters. In 2007 the collective won the First Prize of the Best Art Practices Award by the Italian government for the Frontera project.